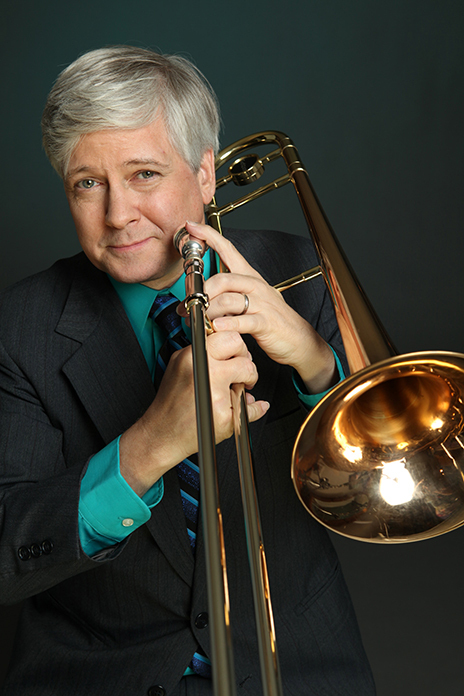 Scott Whitfield (trombonist, composer, arranger, and vocalist) is internationally recognized for his work with contemporary big bands, including those of Toshiko Akiyoshi, Bob Florence, Clare Fischer, Johnny Mandel, Bill Holman, Phil Norman Tentet, Glen Miller Orchestra, Stan Kenton Alumni Band and Jimmy Dorsey Band, as well as his own Scott Whitfield Jazz Orchestras (East AND West). In addition to Scott’s own recordings, his compositions and arrangements have been performed and recorded by such artists as Diva, Maurice Hines, The Pied Pipers, The Modernaires, Bill Allred’s Classic Jazz Band, and Pete Petersen’s 23-strong Collection Jazz Orchestra. Scott’s playing, writing, and singing have been compared to that of some of his biggest influences, including Carl Fontana, Frank Rosolino, Thad Jones, Sammy Nestico, Mel Torme, and Jack Jones. While jazz ensemble composition and arranging is his forte, he’s arranged for the Omaha Philharmonic and The New York City Pops Orchestra. Settling in New York in 1993, Scott became a member of the Nat Adderley Sextet, which also included Jimmy Cobb, Walter Booker, Vincent Herring and Rob Bargad. The group’s engagements at Sweet Basil led to fruitful associations with Nnenna Freelon, Frank Wess, Lionel Hampton, Wayne Andre, and many others. He has also performed in many Broadway show orchestras, and backed the likes of Robert Goulet, Rita Moreno, Marilyn McCoo, Vic Damone, Jack Jones, Nancy Wilson, Natalie Cole, Frank Sinatra, Jr., Patti Austin, and a host of others. Scott served on the jazz faculty at Rutgers University from 1998 to 2002, teaching trombone, composition and arranging, and improvisation, while also coordinating the school’s combo program. Scott is a Getzen artist, and has appeared throughout the world, from Australia to Zurich, sharing his expertise on trombone technique, improvisation, composition, arranging, and jazz history. The Scott Whitfield Jazz Orchestra (first founded in 1986, while Scott was pursuing his Master’s degree at North Texas State University) now has two incarnations: the SWJO East, based in New York; and the SWJO West, based in Whitfield’s new home of Los Angeles. Both of these aggregations feature the top players in the business. For more than a year, the SWJO East was in residence at New York’s Birdland, the Jazz Corner of the World. Scott plays with such reckless, high-wire act abandon, like maybe (Frank) Rosolino on speed.